There is a neat symmetry to Stirling Albion playing at a ground called Forthbank (although, I believe it is presently groaning under the cumbersome moniker of The DoubleTree Dunblane Stadium), as this was the name of the home of the town’s first senior football club, Kings Park. Formed in 1875, Kings Park joined the Scottish League Division 2 in 1921, where they remained until the start of the Second World War. They only once, in season 1927/28, looked like they might attain promotion to the top flight, but the club nonetheless acquitted themselves admirably at league level. Especially when one considers the fate of so many other clubs who entered the Scottish League during the 1920s. It was, however, the Luftwaffe who put paid to Kings Park when, in 1940, a German bomber dropped part of its payload on the town of Stirling, hoping to destroy Stirling Castle where Rudolf Hess was supposedly hiding out. Well wide of the mark, one bomb landed on the stand at Forthbank, totally destroying it. After the war the present club, playing at a new ground Annfield was formed, and Kings Park FC was consigned to history. A fact I always find Quite Interesting is that during the early 1970s, whilst Bill Shankly was manager at Liverpool (who, as we all know, play at Anfield), his older brother Bob was, for a spell, managing Annfield based Stirling Albion. Spooky, or what? 1. I once played for a Scottish Junior club. OK, so it may only have been Bathgate Thistle, and it was only a pre-season friendly, and it was only because I was Treasurer at the time, and only 10 players turned up. But I have played Junior Football nonetheless. Sort of. 2. I once scored two goals in a 3-2 win over I cannot remember who (but they were good), in the Livingston Gala 5-aside tournament at Craigshill Sports Centre. 3. I have played at Annfield. Twice. Not the Liverpool one, which only has one n, but the Stirling one. Towards the end of the ground’s life Stirling Council who owned it, in an attempt to maximise income from their property had lain down astroturf, and the pitch could be rented out by any bunch of Herberts. Thus did I strut my stuff at a Scottish Football League ground. I need hardly point out all of the above occurred during the 1980s when I was considerably less spherical than I am now. 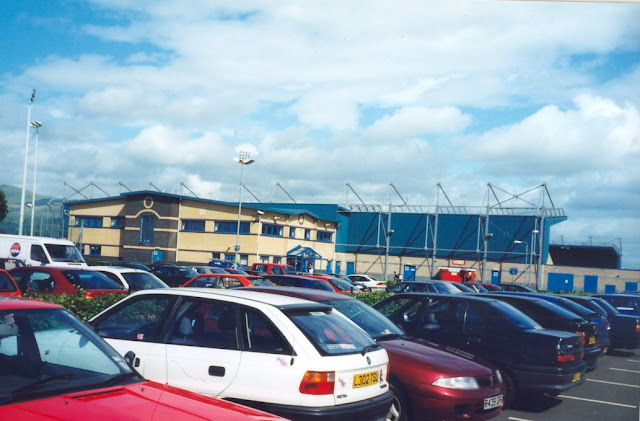 But, by the early 1990s, it became clear Annfield had no long term future, not even as a public facility, so Stirling council sold the ground for housing development and built Stirling Albion a new ground on the eastern outskirts of the town. 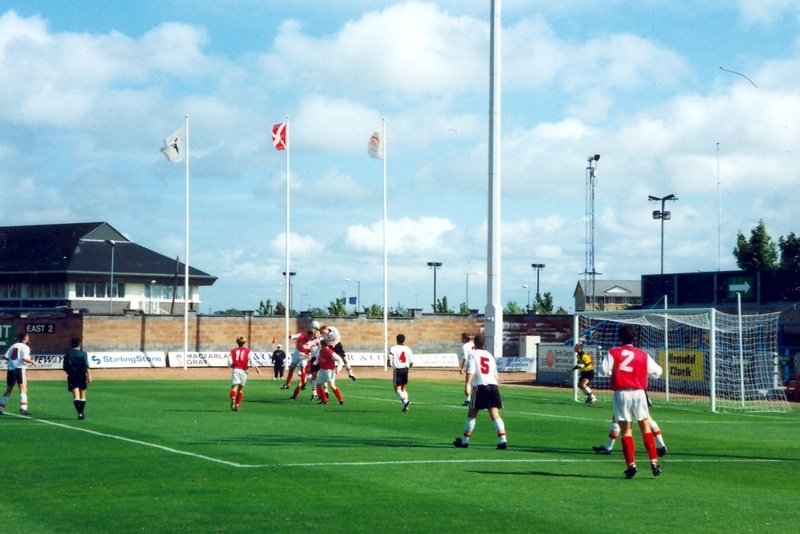 The club moved into these new facilities, named Forthbank to honour the old stadium, in time for the 1993/94 season. This particular match took place during Albion’s fifth season at their new home, and quite a diverting one it proved to be, with visitors Clyde handing out an object lesson in the art of finishing. 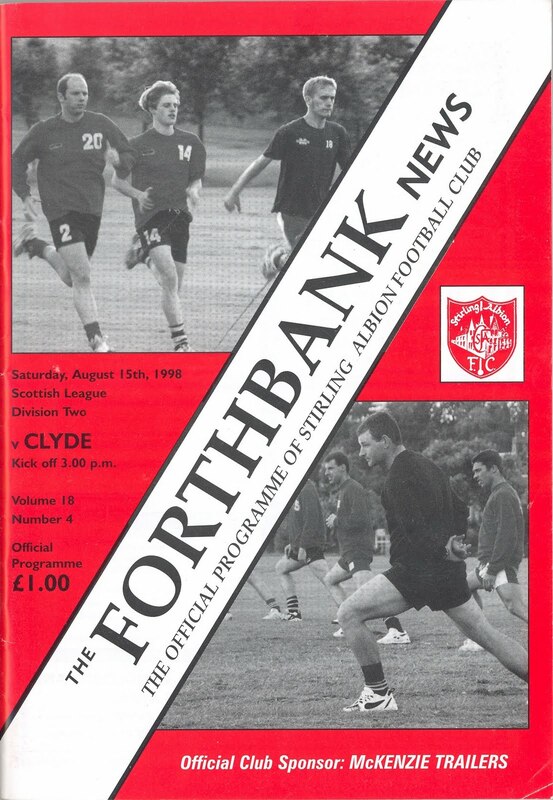 Stirling Albion dominated possession throughout most of the proceedings, but time and again fluffed the frequent opportunities they carved out – Clyde, by contrast, scored early and late in the game with brutal efficiency. Mark McGRAW it was who opened for Clyde in the 7th minute. Although looking well offside when he received Steve Convery’s pass he didn’t muck about, tapping the ball past home ‘keeper Mark McGeown, leaving any subsequent discussions to take place between the Stirling defenders and the officials. The home lads then passed up a clutch of chances to equalise – Alex Bone, Graeme Donald and Andy Paterson all should be blushing at this point. But on 34 minutes BONE, finally carved out a leveller and I, and probably most of the other 1059 in Forthbank Stadium thought Albion would then go on to win. But the rest of the match was just more of the same, although Clyde’s Scott McHarg didn’t half give the Albion crossbar a helluva dunt just before the break. Then with just 8 minutes remaining came the inevitable sucker punch, as substitute Andy O’BRIEN punished the home side’s profligacy.